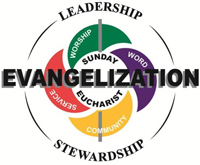 The Office of Evangelization and Parish Life was created in response to a major priority of the Second General Synod of the Archdiocese of Miami and the Strategic Pastoral Plan, "Disciples of Faith, Missionaries of Hope." The office aims to provide support and serve as a resource primarily to the parishes in embracing the missionary call of Christ to "Go and make disciples of all nations" through creating a welcoming and vibrant experience of parish life. The office also designs, develops and implements plans and projects to enhance the implementation of the New Evangelization among the faithful in order to help them advance in authentic discipleship and fulfill their baptismal call and mission to grow to the full maturity of Christ.